The South Fork of the Snake River has been hanging in there, but it’s a little bit tougher than previous years. 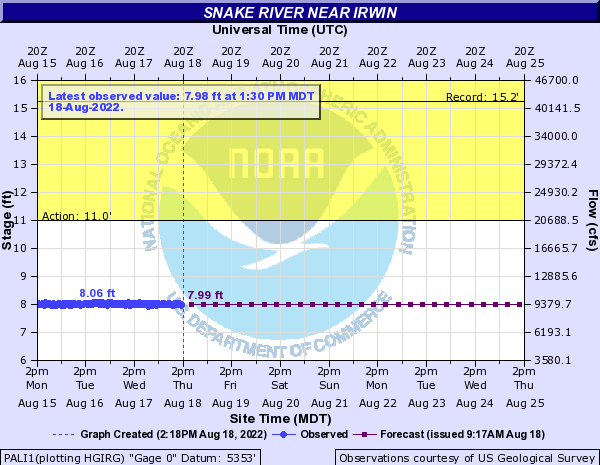 The river has been holding at around 9000cfs for the past week. The average at this time of year is around 7700cfs. Water clarity is excellent, and the flow forecasts are expected to stay put for the next week. Focus on the typical and obvious places; riffles, grassy banks, side-channels, etc. Hopper droppers are essential to success. They are still eating the top bug, but you’ll see more action with the dropper. Use: Split Backs, Jighead Pheasant-Tails, Jighead Hares-Ear, Zebra Midges, Micro-Mayfly; All colors of Chubby Chernobyls, & Waterwalkers. Also, use big & nasty streamer patterns; anything articulated in white, yellow, brown, etc. The post South Fork of the Snake River Fishing Report – Sept 4 appeared first on TRR Outfitters.